It’s summer and as temperatures rise, so do car thefts. There are many reasons for the increased thievery – more people are travelling, windows are left open, cars are left running during quick drop-offs and pick-ups. For car dealers, the stakes are extremely high due to the volume of expensive merchandise and equipment that are on-property. While theft is the main concern for dealerships, these specialized businesses are also susceptible to property damage and trespassing. At one Seattle dealership, vandals caused an estimated $150,000 in damages to almost 30 cars on the lot. At a Florida dealership, a vagrant attempted to sleep in an unlocked car. 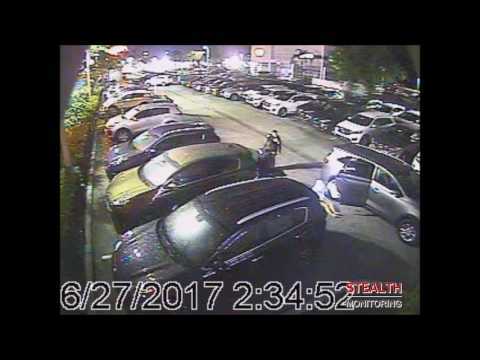 Here is the auto dealership security video. In another instance, our auto dealership security video a trespasser walked onto a Fort Worth dealership and hid inside a porta potty. The Florida and Fort Worth dealerships utilize Stealth Monitoring’s auto dealership security to provide security for their properties. In both cases, one of our trained security operators saw the suspicious activity as it was happening and took immediate action before any damage occurred, by activating an on-site speaker and contacting the police. This proactive solution is more cost-effective than an on-site security guard, who can often cost 30-50% more. Inventory and parts theft, property damage and vagrant loitering are common concerns for car dealership management. Stealth’s auto dealership security systems have been successful in helping car dealerships across North America deter theft and vandalism, minimize liability claims, observe employees, as well as reduce their overall security costs. Contact us to learn more about our car dealership security service and how it can help deter and prevent criminal activity at your property.